It’s no secret that electrical overloads and physical abuse can shorten the life of a handheld meter. But some instruments can withstand far more mishandling than others. 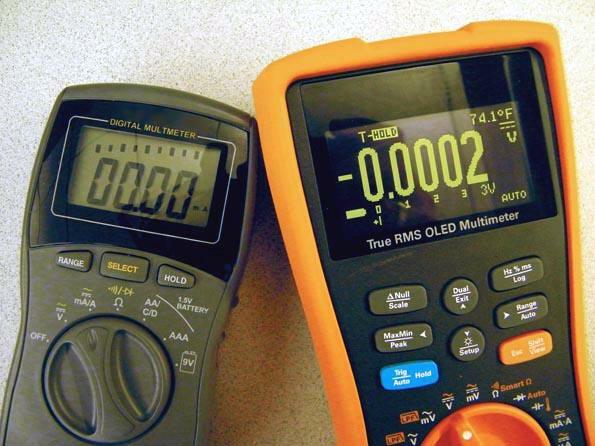 Today it is possible to find handheld digital multimeters (HHDMMs) selling for $20 or less on eBay. But it is just as easy to find posts on online forums whining about the poor accuracy and reliability exhibited by some of these same meters. Clearly there are important differences that distinguish meters having different price tags. The fuses on an industrial meter are typically sized to prevent arc flashes in the event of an accidental short (left). There is only one fuse on the inexpensive meter purchased at a retailer (right) and it is inadequate for arc flash situations. Long-time meter users probably recall the days when handheld multimeters mainly had analog dials. These have all but disappeared except for low-end instruments. The main argument for analog readouts has generally been that they make it easy to see trending information. This argument has become less compelling in recent years as HHDMMs have employed faster sampling to more closely track changes in their inputs. The biggest drawback to analog meters, however, is an input impedance appreciably lower than that of digital meters. The lower input impedance makes analog meters inherently much less accurate than their digital counterparts. The cases housing HHDMM electronics are mostly comprised of ABS plastic and are relatively durable. But there can be important differences in case construction as the price tag rises. The least-expensive meters frequently sit in plain square boxes because the molds needed to make these simple shapes are inexpensive. On the other hand, quality meters, such as the Agilent U1273A, round all corners and edges to spread any compression stresses resulting from direct hits. The compound radii of the plastic mold boosts the initial tooling cost but meter manufacturers consider it a worthwhile trade-off. Rounded case corners are just one of the multiple strategies taken to mitigate inevitable hits and drops. For example, the U1273A has a second layer of overmolding with resilient rubber plastic (PC/ABS) on surfaces that would likely be hit. This overmold textured surface, together with the curved “hour-glass” shape, provide a better grip. Industrial meters constructed this way are generally built to survive 1-m drops to a hardwood surface from any angle, as specified by IEC 61010. And some smaller meters employ a less-expensive protection measure against drops: A protective tight fitting holster made out of resilient plastic. Inexpensive meters usually sport LCD readouts (left). Industrial meters may opt for brighter OLEDs (right) that are easier to read and able to read out more detailed information thanks to the use of a programmable dot-matrix display. 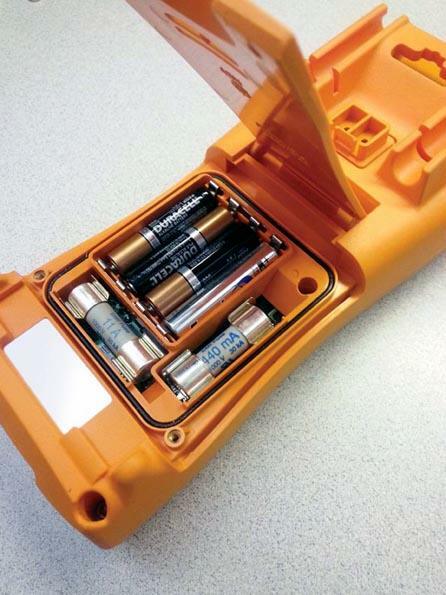 Examine the way inexpensive meter cases are assembled and you’ll typically find the case halves held together with self-tapping screws. The problem is that batteries and fuses are in the case. Repeated entries to service them can become tedious. High-end devices, such as the Agilent U1273A, use a separate battery door that is O-ring gasketed and fastened with machine screws. This sort of attachment technique gives the device an IP54 rating for dusty and wet industrial environments. Few meters go this far. The simplest HHDMMs employ a 3½-digit liquid-crystal display (LCD). Each digit has seven-segments in the familiar figure-8 shape. Meters with more functions have additional LCD readouts illustrating volts, amperes, ohms, AC, DC, etc. In fact, each manufacturer typically custom makes a version of an LCD. They can then choose not to illuminate all the functions for their less-expensive models. But even with steady improvements over the years, LCDs still exhibit a poor contrast ratio, tight viewing angle and sluggishness in cold weather. These are considered trade-offs to be tolerated in return for low cost and low-power consumption. Industrial meters such as the Agilent U1273A may provide access to batteries and fuses through a special battery door. It is not uncommon that inexpensive meters force the user to completely disassemble the case as a means of accessing the batteries and fuses. Not all HHDMMs use LCDs. The Agilent U1273A, for example, uses a 128 × 64 dot-matrix OLED (organic LED) display. OLEDs have extreme high contrast ratios, are viewable across a room, and have a 160° viewing angle. And, of course, dot-matrix displays can be software-configured to display any specific message or repurposed for different functions. The heart of any HHDMM is its analog-to-digital converter (ADC). The ADCs used in the first HHDMMs back in 1970s are still in use today some 40 years later. Many hobbyist HHDMMs still employ the Intersil ICL7106 because it is inexpensive, simple to use, and easy to design into a circuit. The 7106 has a single dual-slope converter with a 2,000-count display, updated at a leisurely pace of two readings/sec. Few electronic devices have such a vintage. Modern advanced HHDMMs use ADCs that are much faster than the Intersil part and which handle multiple tasks. Modern devices are typically 24-bit devices that use a delta-sigma conversion scheme, chosen because it is inexpensive realize with modern ICs. These 24-bit devices allow displays of dual 30,000-count readouts updated at a rate of seven readings/sec as well as an analog bar graph running at 50 readings/sec. Accompanying the higher-resolution displays are more precise voltage references and input-divider precision resistor networks. These works together to deliver higher meter accuracy specifications. They are also fast enough to power additional meter features such as a frequency counter, true RMS ac converter, auto-ranging, and a temperature reference. A hobbyist meter using a 7106 has little use for a beefy MCU. But modern meters carry a controller powerful enough to handle a lot of raw measurement data. The more-powerful controller makes it possible for modern meters to run fairly sophisticated measurement tasks that are just not possible with less-expensive meters. These tasks can include such functions as an automatic offset of stray DC voltage due to leakage current or thermal EMF, measurements of harmonic ratio, selectable dBV or dBm readings with a reference resistance, selectable scaling factors for reading transducers, selectable K or J thermocouple measurements scaled in °C or °F, event-triggered logging using auto hold, trig hold or peak hold, and many more. One other consideration is that of measurement drift over time. Review the operating specs for an inexpensive meter and you’ll likely find nothing about how long the meter can be expected to stay calibrated. But even inexpensive meters probably provide a means for recalibration. The usual means is with trim pots on the PCB that were used to adjust the meter when it was originally manufactured. The problem is that the average cost of a calibration in an accredited lab probably exceeds the unit’s retail price. In contrast, industrial meters, such as the U1273A, typically have a one-year calibration cycle, following standard industry practice. There are no pots to adjust. All recalibration takes place through software. The case is never opened for calibration. Information flows through an IR port on the back of the meter. And the entire process can be automated. HHDMMs sometimes get used for dangerous tasks. One of the most notorious is the testing of industrial power circuits that have enough electrical energy to create a lethal arc flash. And accidents can happen. Suppose an operator inadvertently connects to either of two amp jacks on the meter instead of the voltage jack. This action could short circuit the industrial power line, potentially causing a lethal arc flash. Commercial and residential circuits have circuit breakers to protect against these accidental short circuits. But the circuit breakers and fuses in industrial circuits do not provide this kind of protection. They are set at much higher fault energy levels. It is up to the meter to protect the user from this kind of lethal error. Handheld digital multimeters made today all tend to have block diagrams that are similar. But some of the most important meter features concern ergonomics and safety. These don’t show up in block diagrams. When configured properly, the HHDMM has a high input impedance that will block the high-energy voltage for safe testing. And in meters like the U1273A, one can see two specialty fuses behind the battery door, each protecting one of the two ampere jacks. Fuse makers actually designed special fuses just for this task. The fuses are small enough to fit inside an HHDMM but are capable of interrupting high-energy arc-flash fault current over 10,000 A. These fuses are special and expensive. There are no cheap import substitutes for them. Hobbyist HHDMMs do not offer such protection. That’s why inexpensive hobbyist HHDMMs should never be brought into industrial environments. Accidental short circuits aren’t the only hazard HHDMMs must guard against. Another is voltage spikes of a few thousand volts that last a few microseconds. Lightning strikes are the most-common source of such spikes. At such high voltage, these spikes easily cause arcing across exposed adjacent metallic surfaces. The problem is that unlike a simple static discharge, a voltage spike on an industrial power supply does not extinguish once struck. The industrial line voltage can sustain the discharge once it gets going. There is enough plasma in the air to conduct an arc flash, whose energy release, in turn, produces more plasma to feed the discharge. The small volume inside the HHDMM case poses a challenge for meter designers who must avoid placing metal surfaces too close together. IEC standards define the creepage and clearance requirement for the meter PCB but they are different for industrial, commercial or residential circuits. Hobbyist meters will not meet the IEC standard for creepage and clearance that applies to industrial circuits. Indirectly, these spatial requirements define the minimum package size of HHDMMs. That’s why the size of an HHDMM today is roughly the same as that of a model from the 1970s.